Everyone uses paperclips, but how many people have hippo-shaped paper clips? We do! 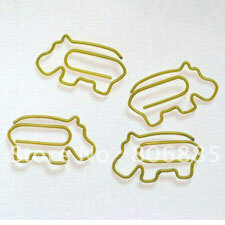 These vinyl wrapped wire paper clips are formed into the best shape of all - hippo shape! Use them in the standard way to hold papers together or think of new uses - chip clips, bread clips, book marks, etc. Yellow only. About 1 5/8" long.